I don’t think Jeremy has ever regretted agreeing to one of my plans for an outdoor adventure more than when we got about ¾ of the way into our day hiking in the Grand Canyon and he looked up and saw how far we had to climb to get out. 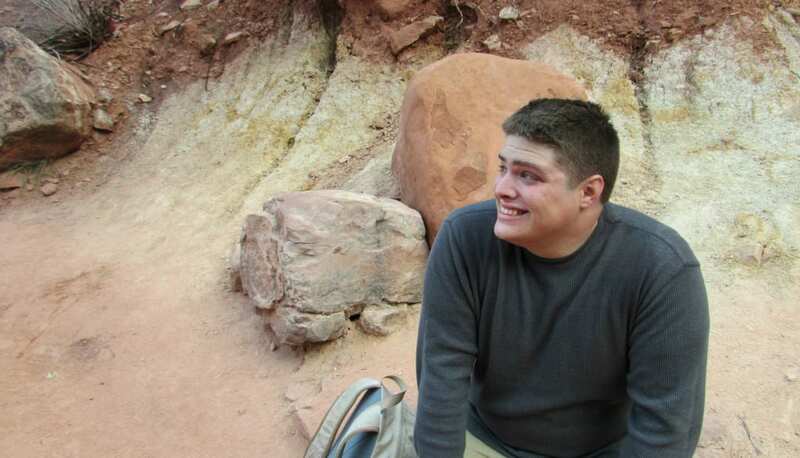 Exhibit A, his face when looking up from inside the canyon and calculating how far we had to go to get out. Meanwhile, I was having the time of my life and trying to ignore my stubbornly aching feet. The Grand Canyon is one of those places that I’ve always kinda-sorta wanted to see, but I severely underestimated how much it would blow me away. It is truly a feast for the eyes at every level, and completely defies photography. Cameras cannot adequately capture the vastness of the place, and the vastness is an enormous part of what is so incredible about it. Sadly, we only had one full day to experience the magnificence. We enjoyed one glorious sunset as we drove into town the night before our hike, and then woke up the next morning with a plan to spend almost 14 miles hiking in the Grand Canyon (this would be the part of the plan that Jeremy objected to). There are no words. Taken on the South Kaibab trail while the sun was still rising. 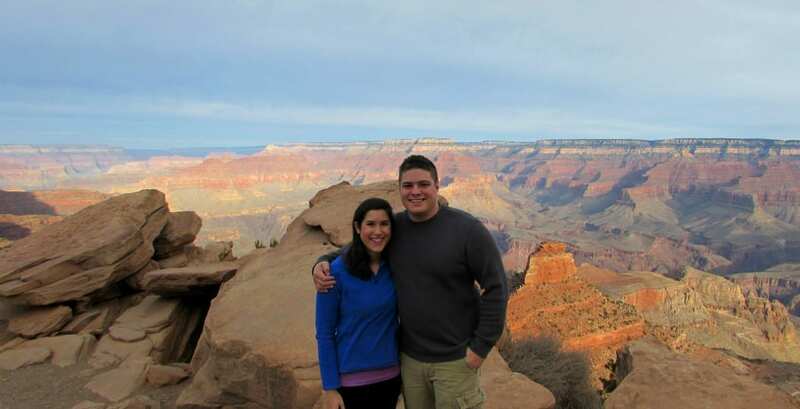 You see, it was December, which is in my biased opinion possibly one of the best times to visit the Grand Canyon. Either you get snow, which is supposed to be incredible, or great hiking weather, because the infamous “20 degrees warmer at the bottom than the top” works to your advantage. We lucked out with almost perfect hiking weather–in the 50’s F at the top, and the 60-70’s F once we were in the canyon. The sun shone all day. 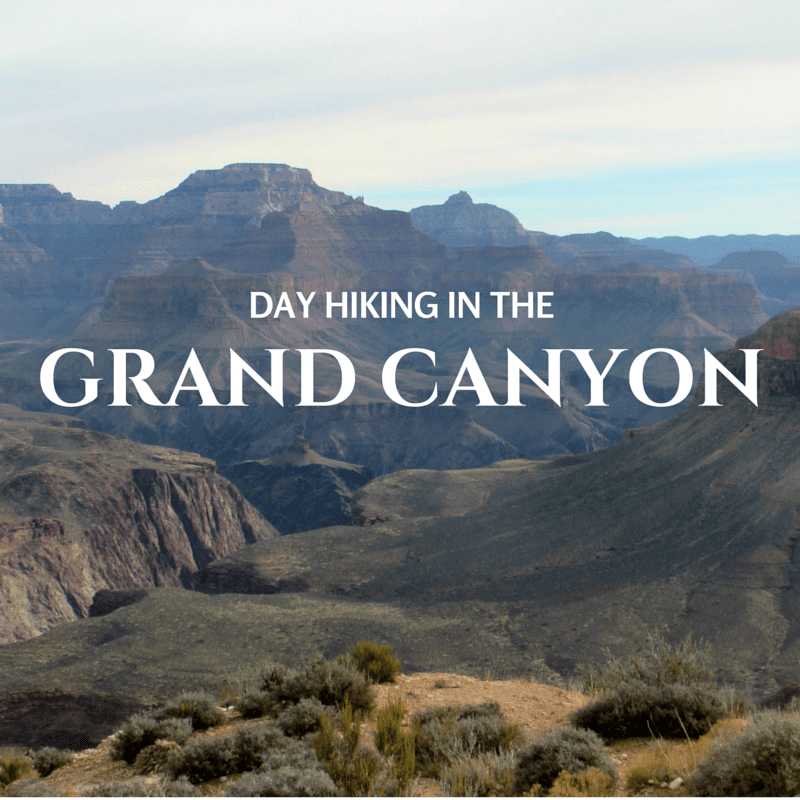 Because of this luck, I wanted to spend as much time hiking the Grand Canyon as possible in one day, and thought we could stretch our limits to do it. We did not attempt a rim-to-river-and-back hike, which the National Park Service vehemently objects to and warns against at every possible opportunity. That is about an 18-mile hike, and sadly, I had to contend it would be too much. Instead, we planned on hiking down South Kaibab, cutting across Tonto West, and then climbing back out via Bright Angel. 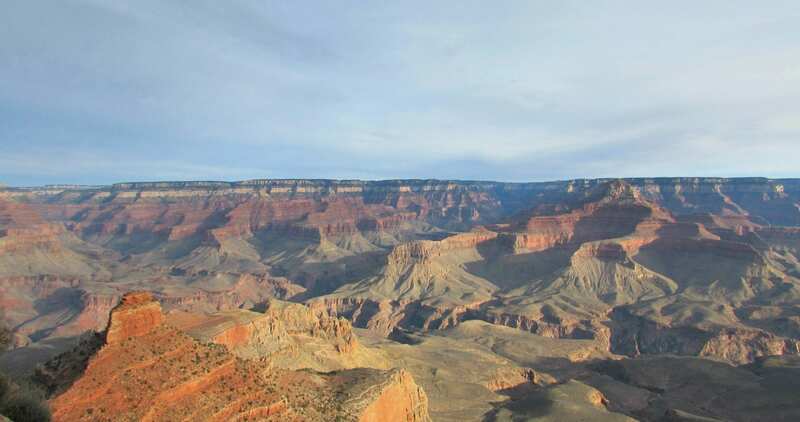 This would allow us to see two of the famous trails, have lunch at Indian Gardens, and spend plenty of time deep in the canyon. The plan, ultimately, worked out perfectly: we entered the canyon about half an hour after the sun started to rise and exited just as the sun was going down. 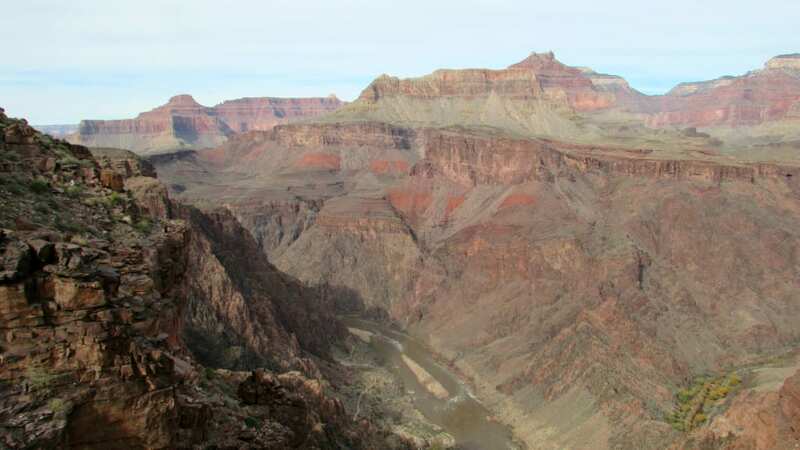 We did make one wrong turn and continued down South Kaibab maybe ¼ mile longer than intended–our feet ached over it, but we did end up with a pretty decent view of the Colorado River, so we’ll count it as a win. If we do it again, we will definitely get an earlier start, but the pull of sleep was strong that morning. It is worth noting that we kept up a pace of about 1.5 miles an hour averaged over the whole day, while the National Park Service suggests that an average pace is about 1 mile per hour. Know your body: if you walk slowly, make sure you take that into account when planning your route. If you have any health issues, or are not comfortable hiking for long periods of time, consider what a reasonable route would be. Exhausted bodies aside, though–there is nothing like being in the canyon. 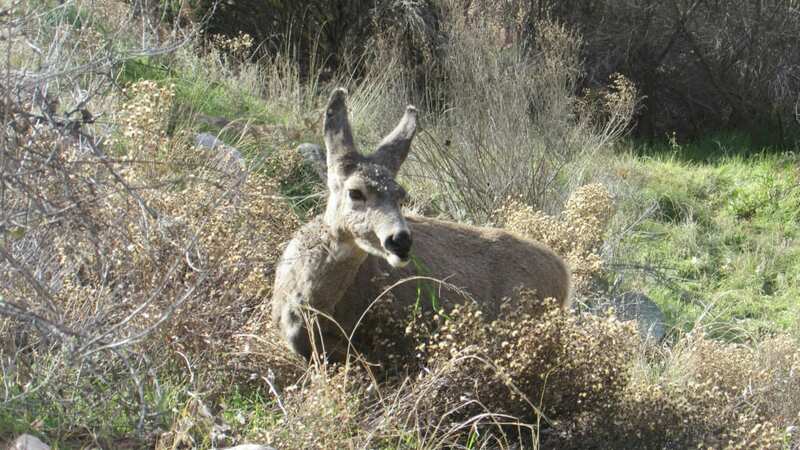 We were lucky enough to see tons of wildlife, including adorable mule deer who were not remotely bothered by our presence, and one bighorn sheep that startled us by bounding right across the trail not 20 feet ahead of where we were. 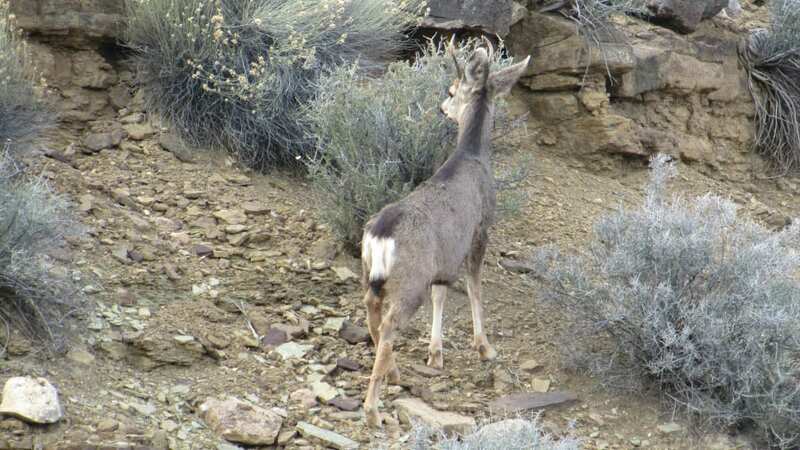 Unfortunately, he was gone by the time I whipped out the camera, but I’ll still never forget the sight of those horns. The mule deer were consistently more interested in food than people’s cameras. Even when the animals weren’t around, the sights were incredible. We just felt so small in the canyon, and it is amazing. You have literally been swallowed by nature, and I could sit and stare around at it for hours (which is necessary, because breaks are a thing that must happen regularly). Basic hiking safety is a must: bring plenty of food and water, tell someone where you’re going, know your limits. 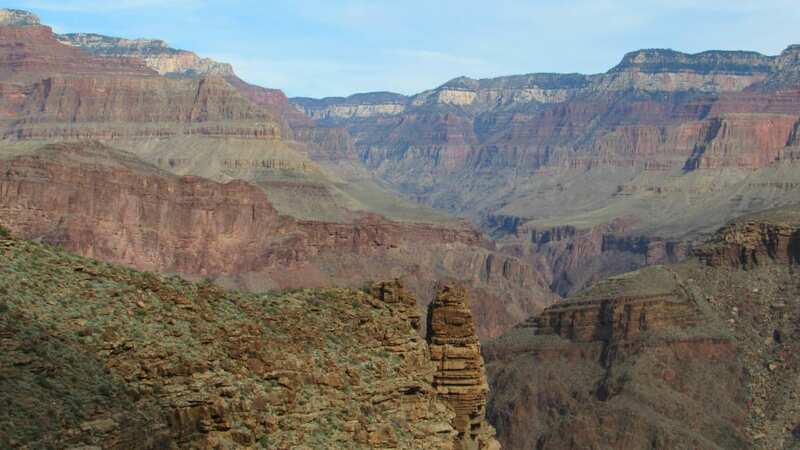 Day hiking in the Grand Canyon presents an unusual hiking pattern in which the first half of the hike (going down) is objectively much easier than the second half of the hike, when you’re already tired (going up). Down is, however, an option that anyone in decent shape should take: you will never regret the effort, at least once you finish climbing back to the top.